The Three Dancers / Elena Kats-Chernin. Instrumentation: Soprano saxophone, percussion, accordion, piano, violin, cello, double bass. Commissioned by Australian Festival of Chamber Music, International Wimbledon Music Festival, Dancenorth, El Paso Pro Musica, Sitka Summer Music Festival, Northwest Bach Festival. Includes 2 parts for the accordion, one with alternative fingerings. Inspired by Picasso's 'Three Dancers'. 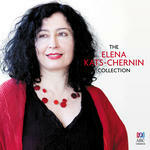 Score: The Three Dancers / Elena Kats-Chernin.